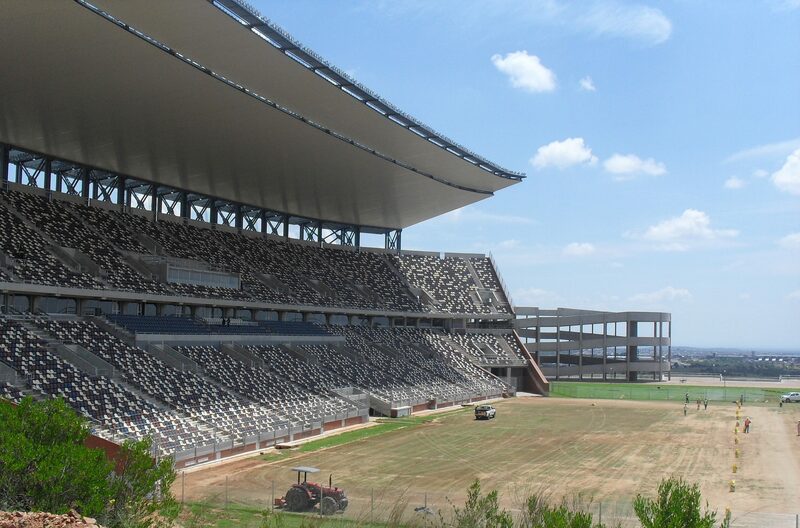 In the build-up to the 2010 FIFA soccer World Cup, the Soshanguve Giant Stadium was identified as a training venue, and one that needed to be upgraded to FIFA standards. R&R Consulting (which later merged with Zitholele Consulting), was appointed in a partnership, to provide the structural engineering services on the project. The planning and preliminary design of the stadium entailed the design of the full approximately 45,000 seater capacity stadium, however only the western pavilion was finally constructed, along with VVIP, VIP, player and full media facilities. The pavilion consisted of a double-tier arrangement, which ensured that all spectators had full view of the entire playing surface. The structure was designed in a modular portal frame arrangement, so that the future phases could easily be developed without significant interruption to the western pavilion. The two lift and stair lobbies in the western pavilion were used to stabilize the pavilion, while the seating panels were designed as precast concrete panels that could be constructed independently of the main pavilion structure. Purpose made seating was then attached to the seating. The roof structure consists of an impressive cantilever structure that is anchored to the base of a large concrete column at the rear end of the portal frame. The pavilion itself consists of wide concourses to ensure easy movement of spectators through the stadium, as well as to adhere to evacuation requirements. Access to the concourses is facilitated through an independent ramp structure, with access at each of the concourse level. The ramp structure, also constructed in reinforced concrete, adds to the overall aesthetic of the facility. A full time construction monitoring presence was maintained on site, to ensure that construction was executed in accordance with the design drawings and specifications.